Getting married in Manhattan puts you in the center of everything. Your location will give your guests easy access to a range of places to stay and attractions to explore before and after the reception. 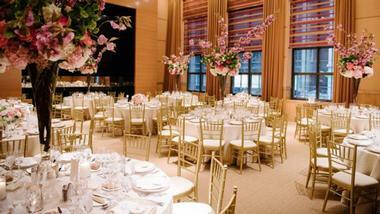 Because of Manhattan’s international influences and varied venues, you can find a wedding venue to match any taste. Whether you want to get married in the same hotel in which you spend your first night as newlyweds, prefer to tie the knot in a historic building or museum, or even want to get married and celebrate outside, there are dozens of choices to help make your day incredibly special. 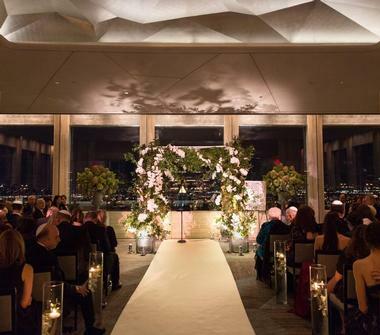 The Rainbow Room has amazing views from its 65th-floor location in Rockefeller Plaza, ensuring that you can see the sights of Manhattan on your special day. 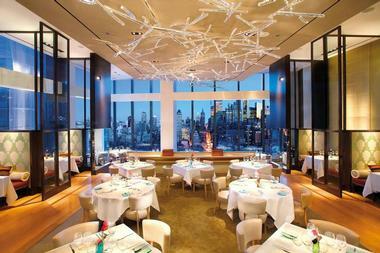 The Rainbow Room has sparkling chandeliers, a rotating dancefloor, and a domed ceiling. The windows are covered in crystal curtains that let you glimpse the skyline while still creating a beautiful atmosphere within the space. Your cocktail hour can include options like passed hors d’oeuvres, a raw bar, a little burgers station, or a classic beef Wellington station, while the dinner can feature an appetizer, choice of entrees, and choice of dessert. There is room for 300 seated guests without a dance floor or 250 with one. 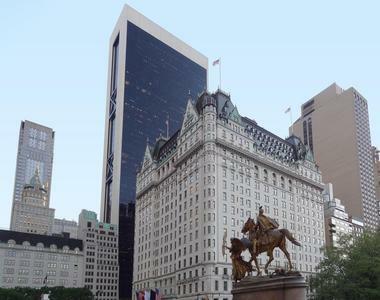 The Plaza is a New York City staple that has hosted guests for more than 100 years, during which kings, presidents, actors, musicians, and more have stayed here. It is an iconic spot to spend your first night as newlyweds and for hosting your wedding ceremony or reception. The Grand Ballroom’s opulent canopy sets the stage for elegance or you can enjoy the Terrace Room in all its magnificence. Your special day is timeless yet modern in this venue. The team at The Plaza works closely with you to plan your special day down to every detail, ensuring it is perfect. 404 NYC is a premier New York City venue for your upcoming wedding, with a multi-level event space spanning 7,500 square feet. Its Midtown West/Hudson Yards location is incredibly convenient for you and your guests and from the ground floor entrance, you can admire the surrounding area via the 25’ by 48’ glass façade. The white walls of the facility are ideal for projecting special videos and there are four restrooms located throughout. During your event, you get a state-of-the-art sound system and can enjoy upgraded high-speed internet. 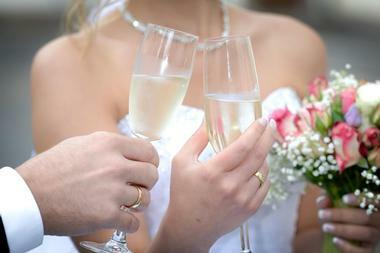 The ideal capacity for a wedding is 175 people or fewer, or you can opt for a cocktail reception with 450 people. From the 620 Loft & Garden, you will enjoy extraordinary views of St. Patrick’s Cathedral and Fifth Avenue while strolling through the manicured historic garden. Take some wedding photos by the reflective pool or the gorgeous blooms. Thanks to a tented area, the garden is available for weddings all year round. The loft is completely customizable, so you can always have amazing views with nearly any configuration you want, whether it is a cocktail reception or sit-down dinner. The interior space includes an 1,872-square-foot area with another indoor 432-square-foot space adjacent to the 228-square-foot exterior tented area. The main outdoor space spans 684 square feet. 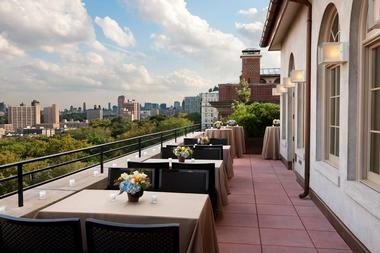 The Columbia University Faculty House is an exciting location for your wedding or any other special day. Its Upper Manhattan location is highly convenient while the space shows off Ivy League charm along with timeless style. The first floor is perfect for a small reception area, while guests admire the courtyard, marble staircase, and original terrazzo floors. You will likely want to take numerous wedding photos on that impressive staircase. The second floor was designed with versatility in mind while the third floor is perfect for formal catering, including space for 250 guests for a meal and dancing. Alternatively, the fourth floor’s space has a vaulted ceiling plus arched windows. In addition to offering iconic accommodations with five-star luxury in a modern deco building, the Four Seasons Hotel is a great place for your wedding. The ceilings measure 21 feet in height for drama, giving the ballroom a soaring and elegant feel. Fit 270 people in a reception or 120 for dinner along with a dance floor. To make sure your day goes off without a hitch, the hotel also offers wedding planning from on-site dedicated professionals. Your consultant works with you to ensure your day goes exactly how you want. 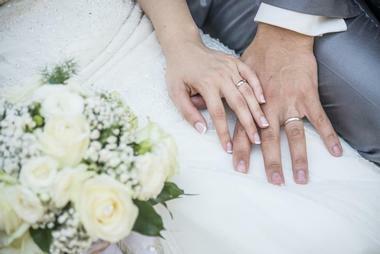 For those who don’t need the planning services, there are also several wedding packages to choose from, including things like a complimentary two-night stay, a three-course dinner, and a premium open bar. For a more unusual wedding venue, consider Gary’s Lofts. This space consists of multiple studios in Manhattan as well as Brooklyn, which together offer 32,000 square feet of room. These spaces include fireplaces, roof tops, and more. The Manhattan studios have amazing lighting for natural photos while the penthouse has skylights for even more natural light, perfect for framing your wedding photos or just illuminating your ceremony and reception. Nearly everything within the studios can be rearranged, letting you create the space that is exactly what you want. The spaces host numerous weddings in addition to photo and video shoots. You can even bring your dog to this venue, provided he doesn’t cause any damage, perfect for those who want every member of their family to attend the wedding. Gotham Hall has hosted a range of events over the years and their planners can help you plan your wedding, whether you want a small, intimate affair or a lavish celebration. As they only host a single event at a time, you will always have the utmost privacy and security along with staff who are dedicated purely to the needs of your wedding. The main banquet hall’s architecture is gorgeous, perfect for an elegant wedding. Between the gilded dome and skylight, the Grand Ballroom sets the perfect feel. For a more intimate affair, celebrate in one of the reception halls. In addition to a hotel with all the amenities you could want, Hotel Giraffe has the 1,300-square-foot Penthouse 1202 that is retro-glamorous and ideal for weddings and other celebrations. 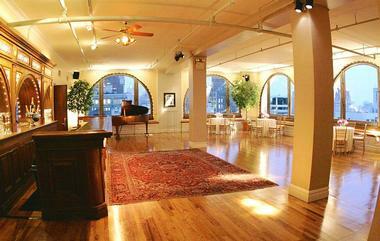 Its vaulted barrel ceiling is 26 feet tall and the windows show off panoramic views of Manhattan. There is even a private terrace, landscaped roof garden, and fireplace. You can rent Penthouse 1202 by itself or with the roof garden and Park Avenue Terrace, each of which can also be rented separately for more intimate weddings. Penthouse 1202 itself can hold 50 for a plated dinner, 40 for a seated buffet dinner, or 60 for a cocktail reception. Kimpton Hotel Eventi has revamped its ground floor to create an eclectic-chic space and there are new restaurants and bars in this hotel. Between the dynamic outdoor and indoor areas, there is also plenty of room for your special day. The ballroom is 4,000 square feet in size and features floor-to-ceiling windows to admire the surrounding views. Fit 250 guests for a seated dinner or 350 for a cocktail reception. All wedding spaces have plenty of natural light to illuminate your day and you can enjoy in-room styling from the Blo Blow Dry Bar on the Go. There are also LGBT wedding packages available. Right in the middle of Manhattan, the Kimpton Muse Hotel is ideal for brides to be who want to be in the center of everything. The newly renovated building is perfect for the reception as well as for spending your first night together as newlyweds. The event space has a charming personality and chic ambience, along with staff who work hard to ensure everything about your special day is perfect. The venues are flexible and can accommodate up to 80 guests in a seated dinner or 120 in a cocktail reception. 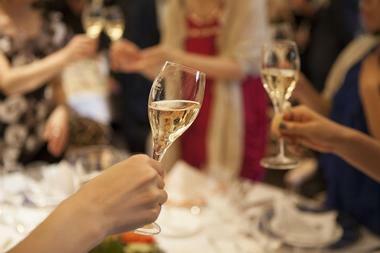 For a more intimate gathering, host the reception at a private room of the NIOS restaurant, which is part of the hotel. Landmark on the Park is just a few steps from the historic area of Central Park West, giving you amazing views of the Upper West Side and easy access to numerous spots for your wedding photos. The interior is spacious and gorgeous with amazing acoustics and beautiful lighting. The venue has more than 20 years of experience hosting weddings as well as the experts needed to make the night go smoothly. They can take care of everything from photography and videography to music to floral designs and catering. With lighting and décor taken care of, you have nothing to worry about and can enjoy the day. They even have afterparty services available. The Mandarin Oriental is a beautiful luxury hotel for visitors to Manhattan with a bird’s eye view of the city and a stunning space to host your wedding. 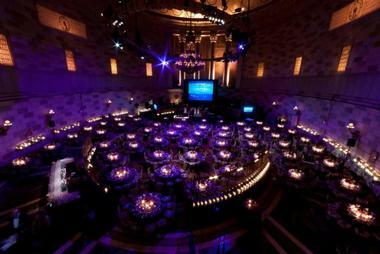 For your event, they will work tirelessly to deliver excellent service and a special setting. Their event planning team will work closely with you and can even suggest the top wedding planners in the city and liaise with them directly. Their catering team will create a signature menu for your reception and the hotel’s suppliers will find the ideal lighting, music, and table settings. The Spa at Mandarin Oriental will help you relax before your big day and you even get to enjoy a complimentary suite. The Manhattan Penthouse on Fifth Avenue used to be the headquarters of Readers Digest, but now it is the only event venue taking up the entire floor of a penthouse. You and your guests can look at the giant Palladian windows for sweeping views of the city and enjoy top cuisine with beautiful presentation. The company has been catering since 1973, always refreshing their menus and offering customization for your wedding. 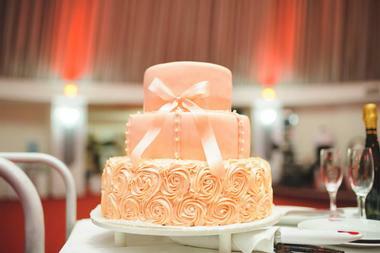 The catering executives have studied hospitality and catering, making them perfectly suited to plan your wedding day. The space can fit 200 people along with a dance floor and you can get a discount if you choose a less popular day of the week or month. 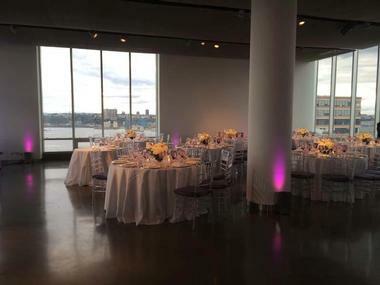 The Midtown Loft & Terrace is an upscale venue in Midtown Manhattan with your choice of two elegant spaces for your wedding: the loft or terrace. 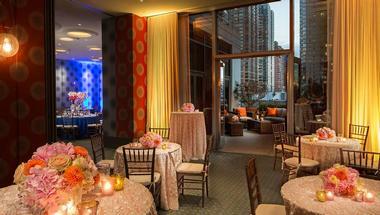 The Midtown Terrace puts your ceremony or reception within view of the skyline. Continue to the Midtown Loft for the reception, where the in-house production company can ensure you have the perfect evening with draped ceilings, chandeliers, and TV screens if you want them. The loft can accommodate 180 for a seated, served dinner with a dance floor and includes a VIP room along with a full kitchen and high ceilings. The terrace can fit 150 in a cocktail arrangement or 100 when seated. Morningside Castle is one of the venues offered by Masterpiece Caterers and it is a picturesque location for your wedding. 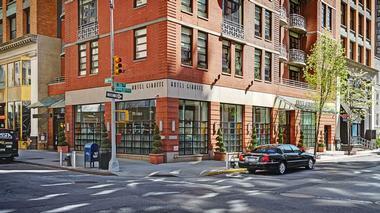 Its Upper West Side location makes it easy to reach, while the building itself has plenty of Old World charm. There are two ballrooms along with a courtyard that is as wide as two city blocks, perfect for those outdoor photos you dreamed of on your special day. There is even a Gothic-style chapel that is ideal for the ceremony itself. You can customize the space in numerous ways as well, personalizing your wedding. The food from Masterpiece Caterers is delicious and can include butler-passed appetizers, a three-course dinner, a wedding cake from Financier Patisserie, and a premium open bar along with a toast. 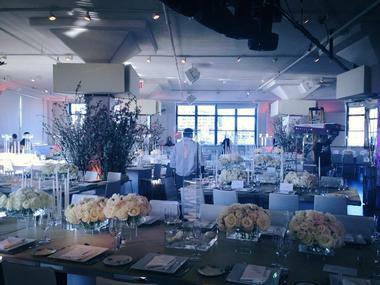 Studio 450 is a one-of-a-kind space for weddings and other events in New York City. This loft space has a rooftop terrace delivering incredible views of the skyline. There are multiple rooms with a total capacity of between 50 and 250, letting this venue accommodate weddings of nearly any size. For a cocktail affair, you can fit 250 guests or 230 for seated events. There is complimentary wireless internet, a kitchen, lounge furniture, coat racks, and other basics. The venue has its own list of recommended vendors for everything from catering and lighting to music and staging to party rentals. The Sunset Terrace at Chelsea Piers sits along the western edge of Pier 61 and this event space has 3,400 square feet of room. It can accommodate between 50 and 300 guests, perfect for a range of weddings. 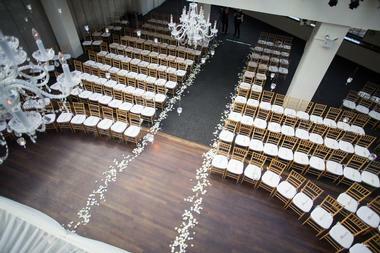 For weddings with sit-down meals, the space is ideal for 75 to 150 guests. The room has Wi-Fi access and panoramic views of the Hudson River. There are a wide range of catering packages offered and the space is open all year round. 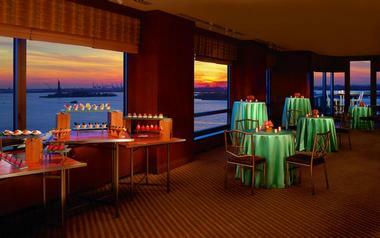 Three walls have floor-to-ceiling windows, so there are always amazing views for a backdrop during your celebration. 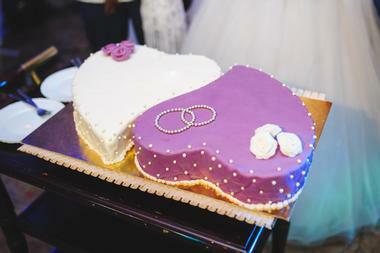 Wedding packages are highly affordable and customizable. The Glasshouses is within the Chelsea Arts Tower on the 21st floor of this architecturally acclaimed building. The floor-to-ceiling windows let you and your guests make the most of being high up, delivering views of Midtown, Downtown, and the Hudson River. The balcony has even better views, particularly for your wedding photos. Glasshouses features two event spaces with 3,600 and 3,400 square feet each, with the latter offering the amazing balcony. You can rent each level separately or the two together. Each individual space can fit up to 150 guests for a sit-down dinner or 200 for a cocktail party, with no minimum party size. In addition to being an elegant hotel known for its upscale feel, the Ritz-Carlton New York in Battery Park is ideal for a downtown wedding by the waterfront with amazing views. In addition to stunning views, there are 18,000 square feet of outdoor and indoor wedding venues along with your choice of packages to customize your day. Select from the Manhattan Ballroom, Rise, the Ritz-Carlton Ballroom, the Liberty Suite, or the Outdoor Plaza. 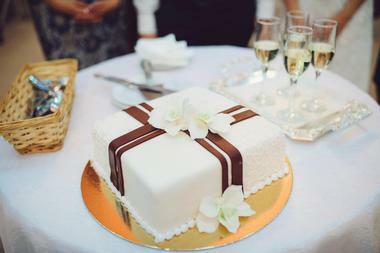 The catering menus include a wide range of choices, including Indian cuisine and kosher dishes and every wedding cake is created by an esteemed NYC cake designer. 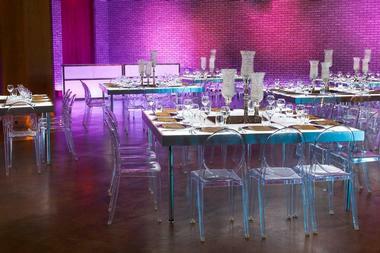 Tribeca 360° gets its name from the 360-degree views you get of the Hudson River and Manhattan from this event venue. The space has 30,000 square feet with a minimalistic and modern design that is highly versatile, letting you customize it to fit your wedding theme. The windowed walls deliver the panoramic views you crave. Whether day or night, everyone will be enthralled by the views out the windows. Guests are welcomed by doormen as they enter the private entrance and go through the lobby. This venue can fit 400 for a seated reception or ceremony and 700 for a cocktail reception. The Tribeca Rooftop is in an industrial penthouse with views of the historic Tribeca neighborhood along with downtown. Because it is open, the roof deck provides 360-degree views of the skyline. The space is ideal for outdoor cocktail parties or weddings. The event team has plenty of experience to ensure everything goes smoothly in the 18,000-square-foot space. The lounge furniture provides spots for relaxation while the landscaping delivers photo opportunities. The rooftop can hold as many as 400 guests or 320 for a seated reception. The Tribeca Rooftop also has an indoor space with a 65-foot skylight for plenty of natural light and the perfect views. Venfino isn’t a traditional wedding venue; instead, they work with you to find the perfect place to host your wedding, no matter what you are looking for. They have a free directory along with high-resolution images to help you make an informed decision. No matter the size of your wedding or the type of venue you want, they can help you find options. There are choices such as lofts, penthouses, designated event spaces, lounges, and more. Simply input how many guests you expect to have and watch the venue information appear in milliseconds. You can also sort by location, pricing, and more.